Fascinating, insightful group blog by a bunch of Google alumni. It’s an absolute must-read for anyone who wants to understand about how start-ups grow, build the team, etc. Perhaps most revealing for me are the hiccups. In a young start-up, every misstep feels like you’re on the verge of failure. Once you read this post, it’s a little easier to put things into perspective about those mistakes. It doesn’t excuse them — they’re never fun when they happen. Great stuff. Wanna bet this turns into a book? A hearty welcome to the newest member of the team, Eric Olson. Eric will be helping me out as we bring more publishers on board at FeedBurner, help I desperately need! I’m excited to have Eric join the team. In related news, we’re hiring again. Check out our jobs page. If you’re in the Chicago area (or willing to join us here in the frozen tundra), please drop us a line. I’m particularly interested in seeing the customer account manager roles filled; if that job description sounds like you, drop us a line or contact me for more details. I’ve been meaning to add this in for a while… Several months ago we announced a partnership with FeedBlitz, a company that makes it easy to subscribe to an RSS feed via e-mail. FeedBlitz setup is now integrated into your FeedBurner account, so turning this on if you’re a FeedBurner user is a one-click process. Not sure how many of you will want this, but it certainly can’t hurt. If you’d prefer to receive e-mails whenever this site is updated, just type your e-mail address in below and you should start hearing from FeedBlitz. 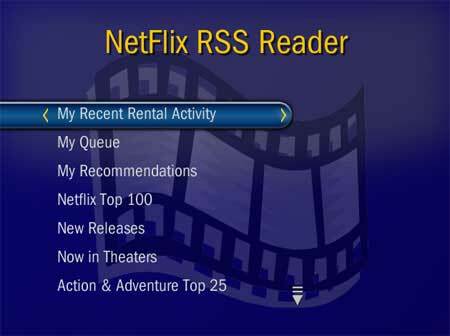 Bitrazor.com has created a Netflix RSS reader for TiVo users. Not sure how easy it is to install (I don’t have a TiVo… yet), but it looks very cool: screenshots. Has anyone with a TiVo tried this? I haven’t, but will definitely check it out. Seems very cool. Josh Marshall’s TalkingPointsMemo turns five years old today. TPM is the rarest of blogs: it often contains original reporting and it enjoys widespread respect among the mainstream media. Most importantly, Josh has done a great job staying on top of stories that don’t always receive a lot of initial attention, only to see them blossom into stories attracting national interest (Trent Lott and the outing of Valerie Plame are just two such examples; the brewing Abramoff corruption scandal and the Italian connection to the Niger forgeries are two recent stories almost certain to follow the same pattern). Congrats, Josh! Keep up the great work. Wow, Joi should definitely put this at the top of his resume. Congrats, Joi! Couldn’t happen to a better woman man. I’ve written about Peter Drucker quite a bit in the past: here, here, here, and here. He was the first to understand the concept of a “knowledge worker” (he coined the term), and foresaw the significant ramifications of that evolution. His Wikipedia bio is here, for those that want to know a bit more about him. Contrary to the Henry Ford approach of breaking down tasks assembly-line style, Drucker understood how managers could motivate workers to use their heads on the job, said John Edwardson, chief executive of Vernon Hills-based CDW Corp.
Update: Via Ross, I see that Drucker’s grandson, Nova Spivack, wrote up a brief remembrance of Drucker’s passing. FEMA is on the line: what kind of trailer would you like? Yesterday I got a call from FEMA. The representative asked if I was still displaced from my home. I told her that I had been back in my house for about a month (I guess the house call that FEMA rep Chloe made hadn’t been entered into the master computer yet – see prior my post on this). Undaunted by this information she proceeded to read the next question on her list: "Would you like FEMA to provide you with a trailer to live in?" "No," I explained with a higher pitch in my voice. "My house is fine," adding "but I know people who do need a FEMA trailer." She had run out of questions and so she wished me well and hung up. Can’t wait to see Ernie this week at BlawgThink, which I’ve been remiss in posting about (have I mentioned I’ve been busy?) but am excited about catching up with a whole bunch of friends. I mentioned the other day we’ve been busy; announcements yesterday and today give you an idea of what we’re up to. Brad Feld, who sits on our board, talked about what he thinks this means, and Frank Gruber shares some of his thoughts as well as links to a number of comments about the recent news. We’re excited about what we’ve built over the course of this year, and what’s even more energizing is that this is just a beginning. The bottom line is that publishers, as they recognize that their print circulation represents a declining audience, need the web to sustain innovation. I’ve been in the publishing business in one shape or another for the last ten years — as a publisher, an author, a columnist, a designer, even a would-be programmer. Today I’m in a wonderful position, talking to publishers of all kinds — from weblog networks to large newspapers, and seemingly everyone in between. And instead of waiting for the technology to develop, they’re actively working to integrate it into their business. Authorities said that sirens blared in many of the communities and that the emergency broadcast system was activated to alert people to the coming storm, but officials believe many people slept through the warnings or could not hear the sirens because of the winds. Yesterday afternoon I ordered the First Alert WX-167 emergency weather radio for a little under $50; thanks to the free trial of Amazon Prime they gave me, $3.99 has it arriving later today. It’ll sound an alarm inside the house if a tornado warning has been issued by NOAA, and seems to have some great features (rechargeable battery slots, so it’ll keep the batteries charged, then run off batteries in the event of a power outage), ability to localize the receiver so you can receive alerts from neighboring counties (and ignore alerts from counties/areas that don’t matter). Seems like a small price to pay to keep the family safe. So the earlier reports of his appearance on the Daily Show being cancelled were premature… turns out that both host and guest wanted to make it happen, so they’re doing it via satellite tonight. Won’t be quite the same, but will still be fun to see our Senator on America’s finest fake news show. Looks like Zogby had a few interns that needed a project to keep them busy: in the world of fake politics, it would appear that Matt Santos is going to spank Arnold Vinick whenever West Wing airs its election. Immediately following Sunday’s live debate, Zogby International will conduct another poll across America to determine who viewers believe won the event, and to see how presidential preferences changed as a result of it. We have The Daily Show for fake news, now we have real polls for fake politics. Go figure.